GREETINGS BEER, WINE & SPIRITS LOVERS! Welcome to the April Edition of the Liquor World Traveler. Happy Spring, everyone! As always, we are excited about some great new products that have just arrived at LW. Here are a few we want to tell you about. Happy Passover to all of our Jewish friends. We have a collection of kosher wines from Israel for your Passover seder. We have many beautiful wines for your celebration. This delicious cocktail is made with a new product at Liquor World, Averell Damson Gin. Top with 3 oz sparkling wine. See below for new product description. 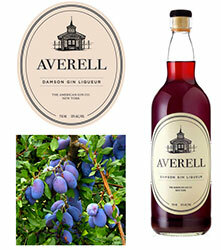 The New York-based American Gin Company produces small-batch gin and Averell Damson Gin Liqueur. The Damson Plum made its way to North America with early settlers. Historically famous in jams, brandy and gin, these small, tart, crimson plums have become rare, losing ground to larger and sweeter cultivated varieties. The plums in Damson Gin Liqueur are barrel pressed to extract the juice along with the rich color of the skins, then blended with a small-batch American gin. The result is an exceptionally bold and bright liqueur, delicious in classic fizzes, with ginger beer, or with Dolin dry vermouth. Along with a limited stock of Damson jam, this is made with each harvest in upstate New York. Produced in much the same fashion as sloe gin, this is produced using Damson plums. These plums are harvested in the fall and all of them come from New York State. The taste is tart, fruity, spicy and just a little sweet. Perfect for your punch making and fizzy gin drinks. Origen Raíz was born of the roots of two familial traditions in different parts of Mexico. Six generations of master mezcaleros with proud Zapotec origins in Oaxaca, bound together with a group of mezcaleros, proudly Duranguenses. A project grew from this union, with respect for our Mother Earth and the gift She gave to our people, the Maguey Cenizo. Origin Raiz is proud and committed to bring the world a Mezcal that was born of respect for the knowledge and values gained from their ancestors. Since 1883, the Distillerie des Alpes located in France, has committed itself to perpetuating the purest vermouth recipe traditions of Chambray and the Alpes. The distillery’s subtle blend of plants, fruits, spices, and flowers are a perfect reflection of the authentic flavors of the locality in France. Vermouth Routin Dry is made from 17 plants, flowers and spices and a subtle blend of French white wine of Sauvignon grape and regional wine of vineyard Jacquère. Its unique bouquet, its subtle dry taste, and its slightly golden color, give it its distinctive character. Rose petals, juniper, rosemary, wormwood, and bitter almond are the priciple flavor components, besides fine French wine, of course! 200 Years of Distilling Experience. Craft distilled in small batches. Wheatley Vodka is made at Buffalo Trace Distillery in Frankfort, Kentucky by Master Distiller Harlen Wheatley. Crafted in small-batches using a one of a kind micro-still, Harlen’s unique wheat recipe is distilled a total of 10 times, triple-filtered and bottled at 82 proof, creating a delicate and balanced profile. This is a vodka that is made to be tasted for what it is, while being able to stand up in a cocktail. Pure and crisp on the nose, with a clean taste and hints of soft vanilla, Wheatley Vodka delivers the kind of exceptional quality and taste you would expect from the world’s most award-winning distillery. Tasting Notes: Pure and crisp on the nose. The fresh and clean taste finishes with hint of soft vanilla. 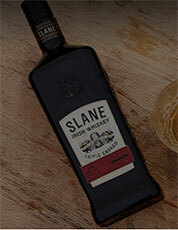 A story as unique as their smooth and flavorful, triple casked whiskey, Slane celebrates the return of exceptional Irish whiskey to Ireland's Boyne Valley. Made by the barrel-raising art and whiskey-making expertise of the Brown Family and born on the historic lands of the Conyngham Family, our award-winning blend brings the legacies of two historic families together for generations to come. Smooth, complex and robust. An Irish whiskey as uncommon as its surroundings and colorful history, each drop presents an opportunity to uncover yet another subtle layer of its full bodied character. Crafted with enduring passion, each stage of their signature triple casked aging process adds to its warm golden hue, alluring aroma and remarkable taste. Malt, toasted grain and malt whiskeys are blended and matured in virgin oak casks, seasoned whiskey casks and Oloroso sherry casks to develop an inimitable complexity. Strong hints of vanilla on the nose follow with a smooth but full bodied mouthfeel that yields notes of Demerara sugar and ripe banana with bursts of rich caramel, vanilla and butterscotch. The whiskey finishes with lingering hints of dried fruit and delicate brown or baking spice. Masterfully blended and aged to perfection, Slane Irish Whiskey is a true reflection of their unique provenance and processes. In 1870, Old Forester founder George Garvin Brown revolutionized the industry by sealing Bourbon in a glass bottle for the first time. Five generations and nearly 150 years later, they are proud to introduce the first Kentucky Straight Rye Whisky from The First Bottled Bourbon. A historic recipe, acquired in 1940 by Owsley Brown I, Old Forester Rye features a mash bill of 65% Rye, 20% Malted Barley, and 15% Corn. Such a high proportion of barley allows for a fully natural fermentation process, forgoing the need for artificial enzymes commonly found in high rye mash bills. Additionally, a generous percentage of malt yields a unique floral character, balancing the sharp, brisk spice of the rye grain. 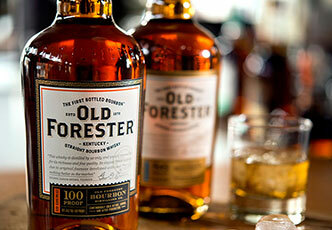 Continuing their legacy of quality and consistency, Old Forester uses its own proprietary yeast strain, produces every barrel, and distills every drop. Aroma: Rich brown sugar and magnolia blossom, with hints of soft sassafras and candied lemon. Taste: Spice awakens immediately leading with sharp black pepper and cinnamon stick, rounding out with notes of dried dill and baked apple. Finish: Allspice and peppercorn introduce a loyal and dry finish which ignites with pine, anise, and bright lemon zest. F lavor: Smooth Vanilla and the perfect touch of oak. Rich, full palate complexity with approachable sweetness, followed by honey dark stone fruit essence. Rounded out with Earthy grains. Nose: Flashes of apple with hints of vanilla and honey over a distinctively pot still base. Palate: Gently spiced with a burst of ginger and butterscotch with background notes of toasted oak. Finish: Long Elegant finish with subtle notes of milk chocolate and almonds. The Macallan Double Cask Gold forms part of their Double Cask range which marries the classic Macallan style and the unmistakable sweetness of American oak. Light citrus notes and boiled sweets that dominate the palate before giving way to cinnamon, ginger and toasted apples. Nose: Lemon citrus, orange peel with an interlacing sweetness of vanilla and dark chocolate. Palate: Medium sweet, malty and slightly dry. Finish: Long with dried fruits,wood smoke and spice. The Macallan Triple Cask Matured 12 Years Old forms part of their Triple Cask Matured range; a series of single malt whiskies crafted in a triple cask combination of European and American sherry seasoned oak casks and American ex-bourbon oak casks. This complex combination of oak casks delivers an extraordinarily smooth and delicate character, full of citrus fruits, vanilla and fresh oak. Nose: Complex, with hints of vanilla, melon and lemon zest. Palate: Medium balanced with lemon citrus, vanilla and light toasted oak and nutmeg. Stillhouse is noted for it’s unique packaging. 100% stainless steel can is one of a kind. It’s unbreakable and chills quickly. Stillhouse uses premium ingredients, made from estate grown corn, distilled to perfection. 100% clear with undeniably smooth finish, Stillhouse is a highly versatile and gluten free spirit. With hints of baked apples, cinnamon, natural oats, brown sugar, ginger and nutmeg, and the kick of StillhouseOriginal Whiskey, you’ve got Stillhouse Apple Crisp Whiskey. Slow distilled by hand in medieval copper pots. In deepest rural Ireland, on the edge of a lake in Drumshanbo, Co. Leitrim, is the home of The Shed Distillery and PJ Rigney. PJ created The Shed Distillery with its medieval copper pot stills, and began a quest to fuse oriental botanicals with the local Irish ones. As it turned out, they got on very well indeed. 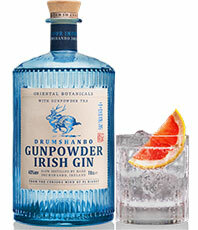 The result of this passionate exploration is Drumshanbo Gunpowder Irish Gin – unique, extraordinary and remarkable, all bottled and labelled by local hands at the distillery. The process begins with an array of ingredients assembled by the curious mind of PJ Rigney. Slow distillation commences. 8 botanicals are added to the copper pot: Meadowsweet, Cardamom, Juniper Berries, Coriander Seed, Angelica Root, Oris Root, Caraway Seed, and Star Anise. 4 Botanicals are added to the Vapor Basket: Gunpowder Tea, Chinese Lemon, Oriental Grapefruit, Kaffir Lime. Time for resting and maturing before the bottles are filled. Garnish with a thick wedge of red grapefruit. Check out more cocktail recipes. Tequila Gran Dovejo is a small-batch, traditionally crafted, tequila made from 100% of the finest, estate grown blue agaves that are exclusively grown and produced in the highlands of Jalisco by the Feliciano Vivanco Family. Unaged and bottled after distillation. Color: Crystal clear, with a platinum hue. Nose: Sweet aromas of cooked agave, honey, citrus and floral notes. Taste: Soft and silky entry, sweet cooked agave pepper and floral accents. Finish: Long finish and sweet peppery fade. Aged in 100% white oak barrels from 18 to 36 months. ?Color: Deep golden color with an amber hue. Nose: Cooked agave, oak, vanilla, tobacco, butterscotch, and spices. Taste: Rich and silky entry with vanilla, cinnamon, clove, orange spice accents. Finish: A long smooth oak and spice fade. 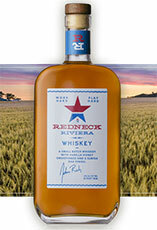 Aged in 100% white oak barrels for 6 to 12 months. Color: Bright golden color with straw colored hue. Nose: Cooked agave, vanilla, orange and spices. Taste: Soft silky entry, vanilla, wood, dried fruits, and cinnamon. Finish: Long warm finish with oak, fruit, and spice fade. Gustoso Aguardiente Artisanal Rum is produced from100% locally grown sugarcane grown exclusively in the highlands of Michoacan, Mexico. The terroir and cool nights of this high altitude create ideal conditions for the cultivation of sugar cane and creation of a complex, deeply flavored rum known as Gustoso Aguardiente Artisanal Rum. The family-run sugar cane farms crafts sustainably produced, small-batch rum that stands in stark contrast to the lighter, mass-produced options. 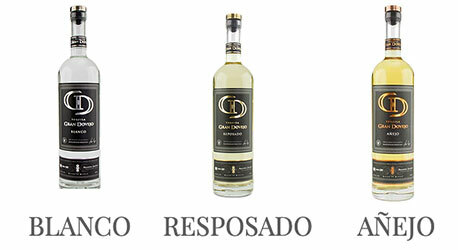 is drier, more flavorful twist is beloved by serious rum aficionados and mixologists, and the communities in Mexico. Taste: Dry, yet lush, palate entry with abundant flavors of toffee, baked apple and vanilla bean throughout an enduring finish. Aroma: Creamy with buttery and herbal notes, a hint of cinnamon, ripe banana. Taste: Full lush mouthfeel, beautifully textured, lasting impression of cream, spice, and vanilla. Plymouth, UK- Beautifully grainy and crisp with scents of pine needle, orange blossom, a dried herb melange, juniper, and dried flowers. Voluptuous on the palate while maintaining perfect balance with the juniper notes. CHAIRMAN'S TROPHY FINALIST 94 PTS-2015 ULTIMATE SPIRITS CHALLENGE. 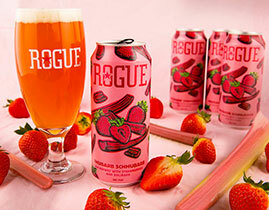 Belgium- Fruit Beer- 8% ABV. Pours a deep dark red color, with a light pink, compact and lacing head. Soft fruity aromas, with hints of almond and mildly sour cherries. Sweet and fruity flavors, with a nice balance between sweet and sour. Super smooth Vanilla Imperial Milkshake IPA from one of Denmark's most talented Craft Brewers. Highly talented and endlessly versatile, whatever Evil Twin turns its hand is going to be good. And Every Day Once a Day Give Yourself An IPA is no exception. One of the new breed of lactose Milkshake IPAs, 'EDOADGYAIPA' is brewed with vanilla to give it an extra glossy, silky smoothness. Pouring deep hazy orange beneath a big white head, this creamy creation is packed with citrus, apricot, peach and mango, and a backdrop of orange peel, and subtle vanilla. Meanwhile the medium body conceals an invitingly fruity hops character to finish on a curiously seductive bittersweet note. St. Bernardus Wit (ABV 5.5%) is a traditional Belgian white ale developed and brewed in collaboration with the legendary master brewer Pierre Celis. It appears a very pale, hazy straw yellow, with a dense, white head. Aroma is wheaty, with apple-like tartness; herbal-spicy notes of coriander, white pepper and orange peel are complemented by a light, honey-like sweetness. Refreshing, tart, and crisp; light-bodied and easy to drink --just what a Belgian Witbier should be! Ratebeer.com rating: 91 (out of 100) 11.2 oz can. 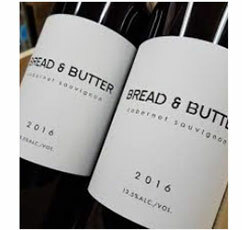 Easy-to-love, everyday wines made by second-generation Napa Valley Vintners John and Michele - the J and M in JaM. Butter Chardonnay just got even easier-to-love—How? We’ll they've put it in cans! Jam's loveable little cans are as ready as you are for your next adventure, pool party, or simply patio-sipping. Butter Chardonnay is rich, bold and luscious. Made in the tradition of quality Californian winemaking, the grapes selected are juicy, ripe and bursting with flavor. They cold ferment this easy-to-love Chardonnay to a lush creaminess and age it in their unique blend of oak. 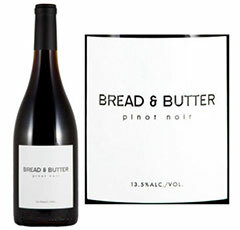 Butter brims with stone fruit and baked-lemon notes and has a lovely, long, vanilla finish. Simply put, it melts in your mouth! 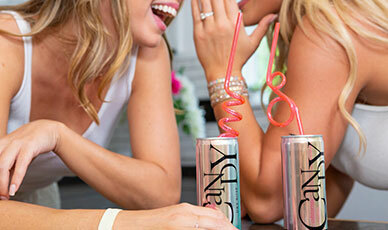 Now it’s even easier to #RoséAllDay with CandyCans! The same delicious dry rosé you know and love is now in ready to go in a 4-pack for your next get together with the girls. Whether you’re kicking it at the beach or packing a few in your backpack to enjoy on-the-go, these convenient cans are ready to JaM out with you, wherever your next adventure takes you! Created in 1824, Corvo has been a self-renewing classic for nearly two centuries. Wines that are right for your everyday, for moments of relaxation and moments of vivacity, full of personality and pleasure. Research, meticulous care and an innate preference for unorthodox procedures are parts of a tradition that feeds the unmistakable quality of Corvo wines. Quality wines, day after day. 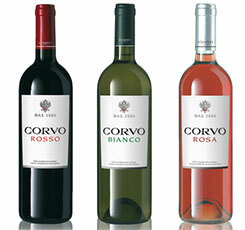 Explore the repertoire of Corvo wines and discover the one that’s right for making your day special, all day long. Corvo Bianco has been a constant presence on Italians tables for over 200 years, thanks to its talent for innovation. Full of Mediterranean character, this wine is produced with the use of modern technology, to assist in verifying the integrity of its ingredients and the naturalness of a final product always ready to offer a simply perfect tasting experience. Corvo Moscato is a sweet, vibrant and refreshing Moscato produced from grapes grown on the sunny hillside vineyards of Sicily. It offers delicate aromas of Mediterranean flowers with a bright, candied finish. Light, fresh, lively, pleasantly aromatic, Corvo Moscato is an intense and harmonious wine. Zinfandel in America. 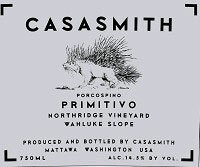 Primitivo in Italy. Rich, dark, unctuous. Briar berry, explosive, ripe and restrained. Makes me want to roll up my sleeves and dig into some spaghetti, red sauce, meatballs and parmesano with crushed red pepper. Northridge Vineyard: Planted in 2003, this vineyard is a very unique 92 acre site in the Wahluke Slope. An alleuvial fan gravel bed, the site rests above the flood plain of the Columbia River. Under the topsoil is a layer of caliche and basalt, 6-12 inches deep, creating a calcium and iron rich media that forces roots to struggle. 3 Finger Jack was a legendary bandit and gunslinger who roamed central California during early days of the Gold Rush, when thirsty miners first began growing grapes and making wine in the present-day appellations of Lodi, California. 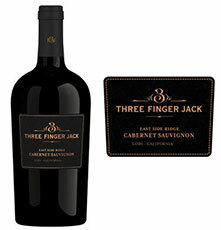 3 Finger Jack Cabernet Sauvignon exudes vibrant aromas of black cherry, ripe currant, fresh herbs and lightly roasted coffee. Smooth tannins and balanced acidity support core flavors of blackberry, black cherry and chocolate, intertwined with spicy black pepper accents on the finish. This Cabernet Sauvignon expresses captivating aromas of mocha, ripe berries, violets, and blackcurrant with intertwining layers of subtle black pepper, toasted oak and rich vanilla. This beautifully crafted Cabernet Sauvignon enters the palate with layers of ripe blackberry and chocolate covered cherries. The round and luscious mouthfeel is accented by soft tannins and a hint of spice that weaves into a smooth, lingering finish. This Pinot Noir boasts juicy red fruit. Think cherries and raspberries with a touch of cassis. Delicate hints of cedar and bay leaf balance the sweetness of the fruit, creating an enduring bouquet. That luscious fruit bouquet continues onto the palate, where it’s joined by soft flavors of oak and savory notes. The rich mouthfeel is complemented by a long and beautifully smooth finish. NWA's #1 source for Wine, Beer & Spirits news and information! We make every effort to assure the accuracy of information & pricing in our correspondence. pricing posted in the store.